COLONEL A W MCDONALD, SR.
A W McDonald, Sr., was appointed colonel, cavalry, Provisional Army of Virginia, on 5 June, 1861, and colonel, 7th Virginia Cavalry, on 17 June, 1861. Captain T Ashby, Fauquier Mounted Rangers, was assigned to guard duty at Point of Rocks, Frederick County, Maryland, on 19 April, 1861, and was appointed lieutenant colonel, Provisional Army of Virginia, on 16 June, 1861, dated 17 July, 1861. O R Funsten was appointed aide de camp at Harpers Ferry, Jefferson County, Virginia, between 24 April and 2 May, 1861, and major, 7th Virginia Cavalry, on 17 June, 1861. The company was accepted in state service at Markham, Fauquier County, Virginia, under the command of Captain T Ashby, on 17 April, 1861, and was ordered to Harpers Ferry, Jefferson County, Virginia, the same day. The company was assigned to picket duty at Point of Rocks, Frederick County, Maryland, on 19 April, 1861, and was mustered in state service for one year as the 1st Virginia Cavalry, Company G (1st), by Colonel T J Jackson, Provisional Army of Virginia, on 3 May, 1861 (See the 1st Virginia Cavalry). Captain T Ashby, 7th Virginia Cavalry, Company A, was appointed lieutenant colonel, 7th Virginia Cavalry, at Winchester, Frederick County, Virginia, on 17 June, 1861, dated 17 July, 1861, and First Lieutennat R Ashby, was appointed captain, 7th Virginia Cavalry, Company A, on 17 June, 1861. Captain R Ashby, 7th Virginia Cavalry, Company A, was mortally wounded at Kell(e)y's Island, at the junction of Patterson's Creek and the Potomac River, six miles south of Cumberland, Allegany County, Virginia, on 26 June, 1861, and died at Washington Bottom Farm or Ridgedale, on South Branch Potomac River, six miles north of Romney, Hampshire County, Virginia, at 12 PM on 7 July, 1861. First Lieutenant W F Turner, 7th Virginia Cavalry, Company A, was appointed captain, 7th Virginia Cavalry, Company A, on (?) June, 1861. Company B (1st) Howard Dragoons: CAPT. G R GAITHER, Jr. The company was accepted in state of Virginia service at Leesburg, Loudoun County, Virginia, on 14 May, 1861, and was assigned to the 7th Virginia Cavalry, Company B (1st), at Winchester, Frederick County, Virginia, on 17 June, 1861. The company was assigned to the 1st Virginia Cavalry, Company M/K (2nd), at Fairfax Courthouse, Fairfax County, Virginia, on 28 July, 1861 (See the 1st Virginia Cavalry). The company was accepted in state service at Cootes' Store, one mile southeast of Brock's Gap, Rockingham County, Virginia, on 17 April, 1861, and was stationed at Harrisonburg, Rockingham County, Virginia, on 18 April, 1861. The company was ordered to Harpers Ferry, Jefferson County, Virginia, under the command of First Lieutenant I G Coffman, 10th Virginia Infantry, Company B, on 19 April, 1861, and arrived on 21 April, 1861 (See the 10th Virginia Infantry). The company was mustered in state service for the war, at Harpers Ferry, Jefferson County, Maryland, on 5 May, 1861, and Captain J Q Wingfield, Letcher Brock's Gap Rifles, arrived at Harpers Ferry, Jefferson County, Virginia, on 8 May, 1861. The company was stationed at Point of Rocks, Frederick County, Maryland, under the command of Captain T Ashby, Fauquier Mountain Rangers, in the evening on 19 May, 1861, and was assigned to the 10th Virginia Infantry at Harpers Ferry, Jefferson County, Virginia, on 11 June, 1861. The company was assigned to the 7th Virginia Cavalry, Company B (2nd), at Hanging Rock, Hampshire County, Virginia, on 21 June, 1861, and Private J C Shoup, 7th Virginia Cavalry, Company B (2nd), was appointed captain, 7th Virginia Cavalry, Company H (2nd), on 7 May, 1862. The company was accepted in state service at Edinburg, Shenandoah County, Virginia, on 15 June, 1861, and was ordered to Winchester, Frederick County, Virginia, the same day. The company was assigned to the 7th Virginia Cavalry at Romney, Hampshire County, Virginia, between 19 and 23 June, 1861, and Captain S B Myers, 7th Virginia Cavalry, Company C, was appointed major, 7th Virginia Cavalry, on 30 October, 1862. The company was accepted in state service at Massanutten, Rockingham County, Virginia, on 1 June, 1861, and was assigned to the 7th Virginia Cavalry at Romney, Hampshire County, Virginia, between 19 and 23 June, 1861. The company was accepted in state service at Front Royal, Warren County, Virginia, on 18 June, 1861, and was assigned to the 7th Virginia Cavalry between 26 and 27 June, 1861. First Lieutenant J Marshall, 7th Virginia Cavalry, Company E, was appointed captain, 7th Virginia Cavalry, Company E, on 7 March, 1862. The company was accepted in state service at Romney, Hampshire County, Virginia, on 1 June, 1861, and was mustered in Confederate service for one year at Duffields, Jefferson County, Virginia, by Lieutenant Colonel T Ashby, 7th Virginia Cavalry, on 4 September, 1861, dated 1 June, 1861. Captain G F Sheetz, 7th Virginia Cavalry, Company F, was killed on 23 May, 1862. The company was accepted in state service at Romney, Hampshire County, Virginia, on 19 June, 1861. The company was accepted in state service at Brock's Gap, Rockingham County, Virginia, on (?) July, 1861, and was stationed at Mount Jackson, Shenandoah County, Virginia, on 7 July, 1861. The company was captured at Columbia Furnace, Shenandoah County, Virginia, on 16 April, 1862, and was reorganised under the command of Captain T L M Chipley on 22 April, 1862. The company was assigned to the 17th Virginia Battalion Cavalry, Company C, on 16 June 1862. The company was assigned to the 7th Virginia Cavalry, Company H (2nd), with the excess men of Company B (2nd) on 7 May, 1862. The company was accepted in state service at Harrisonburg, Rockingham County, Virginia, on 6 June, 1861, and was assigned to the 7th Virginia Cavalry at Romney, Hampshire County, Virginia, on 24 June, 1861. The company was accepted in state service at Oakney Springs, Shenandoah County, Virginia, on 1 August, 1861. The companies listed below were assigned to the 7th Virginia Cavalry until reorganisation on 16 June, 1862. The 12th Virginia Cavalry was accepted in Confederate service at Conrad's Store, on Elk Run Creek, Rockingham County, Virginia, on 21 June, 1862. Henderson's Company was accepted in state service for one year, under the command of Captain J Henderson, at Charlestown, Jefferson County, Virginia, on 26 June, 1861; Baylor's Company was accepted in Confederate service for six months, under the command of Captain R W Baylor, at Charlestown, Jefferson County, Virginia, on 25 September, 1861; Marshall's Company was accepted in Confederate service for the war, under the command of Captain T Marshall, at Winchester, Frederick County, Virginia, on 11 March, 1862; Knott's Company was accepted in Confederate service, under the command of Captain J L Knott, at Shepherdstown, Jefferson County, Virginia, on 17 March, 1862; Marshall's Company was accepted in Confederate service, under the command of Captain J Marshall, at New Market, Jefferson County, Virginia, on 27 March, 1862; Gilmor's Company was accepted in Confederate service, under the command of Captain H W Gilmor, on 26 March, 1862; Willis' Company was accepted in Confederate service, under the command of Captain A M Willis, at Sperryville, Rappahannock County, Virginia, on 31 March, 1862; Sipe's Company was accepted in Confederate service, under the command of Captain E Sipe, at Pughtown, Hancock County, Virginia, on 18 April, 1862; Massie's Company was accepted in Confederate service, under the command of Captain T B Massie, at Conrad's Store, Rockingham County, Virginia, on 27 March, 1862; Rinker's Company was accepted in Confederate service for two years, under the command of Captain I P Rinker, at Woodstock, Shenandoah County, Virginia, on 1 May, 1862. Note: Captain A W Harman, 5th Virginia Infantry, Company G, was appointed colonel, 12th Virginia Cavalry, on 1 July, 1862, dated 21 June, 1862; R H Burks lieutenant colonel, 12th Virginia Cavalry, on 2 July, 1862, dated 21 June, 1862; and Captain T B Massie, 12th Virginia Cavalry, Company I, major, on 2 July, 1862, dated 21 June, 1862 (See the 5th Virginia, Infantry). Captain T Marshall, 12th Virginia Cavalry, Company C, was appointed major, 7th Virginia Cavalry, on 2 July, 1862, dated 21 June, 1862. The 17th Virginia Battalion Cavalry was organised at Conrad's Store, on Elk Run Creek, Rockingham County, Virginia, by Special Orders No.234, Adjutant & Inspector General's Office, Richmond, Henrico County, Virginia, on 7 October, 1862. Note: The 17th Virginia Battalion Cavalry was designated the 1st Virginia Battalion Cavalry, under the command of Major O R Funsten, between 16 June and 7 October, 1862, and Major O R Funsten, 1st Virginia Battalion Cavalry, was appointed lieutenant colonel, 17th Virginia Battalion Cavalry, on 14 October, 1862. The 24th Virginia Battalion Cavalry or Scott's Battalion Partisan Rangers, Company C, under the command of Captain A M Pierce, was disbanded and assigned to the 17th Virginia Battalion Cavalry, Company H, by Special Orders No.3, Adjutant & Inspector General's Office, Richmond, Henrico County, Virginia, on 5 January, 1863. Note: Colonel W H Harness, 14th Virginia Militia (Hardy County), was appointed captain, 7th Virginia Cavalry, on 10 March, 1862; Colonel E H McDonald, 77th Virginia Militia (Hampshire County), on 28 April, 1862; and Captain J T Hess, 55th Virginia Militia (Jefferson County), on 11 May, 1862. The Bath Cavalry, Company A, under the command of Captain A T Richards, was assigned to Captain G Jackson, cavalry, Confederate States Army, during the battle of Rich Mountain on 12 July, 1861. The 17th Virginia Battalion Cavalry was designated the 11th Virginia Cavalry by Special Orders No. 36, Headquarters, Army of Northern Virginia, Edinburg, Shenandoah County, Virginia, on 5 February, 1863. Note: The 5th Virginia Cavalry, Companies F (2nd), under the command of Captain M D Ball, and Weems' Company, under the command of Captain O T Weems, were assigned to the 11th Virginia Cavalry, Companies I and K, respectively, by Special Orders No. 36, Headquarters, Army of Northern Virginia, Edinburg, Shenandoah County, Virginia, on 9 February, 1863, dated 5 February, 1863, and Captain M D Ball, 11th Virginia Cavalry, Company I, was appointed major, 11th Virginia Cavalry, on 15 February, 1863. The Valley Cavalry was mustered in Confederate service for two years or the war with men of 4th Virginia Infantry on 16 April, 1862, and was assigned to the 7th Virginia Cavalry on 25 June, 1862 (See the 4th Virginia Infantry). The company was assigned to the 14th Virginia Cavalry, under the command of Colonel C E Thorburn, by Special Orders No.208, Adjutant & Inspector General's Office, Richmond, Henrico County, Virginia, on 5 September, 1862. Ashby's Artillery or Chew's Horse Artillery was organised at Flowing Spring, Jefferson County, Virginia, by special authority of the War Department on 11 November, 1861, and was mustered in Confederate service on 13 November, 1861. Note: Cadet R P Chew, Virginia Military Institute, was temporarily assigned as acting second lieutenant to the Lee Artillery, under the command of Captain P B Anderson, at Monterey, Highland County, Virginia, between 15 July and September 1861. 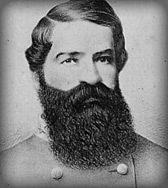 Major P B Anderson, first major, 1st Tennessee Infantry, resigned at Lynchburg, Campbell County, Virginia, on 7 May, 1861, and was appointed captain, Lee Artillery, on 28 May 1861 (See the 1st Tennessee Infantry). "Last night we sent off the Valley Guards, Capt. Sprinkel, 75 men; the Rockingham Rifles, 108 men, Capt. Kenney To-day the balance of the Volunteer Regiment, composed of the Bridgewater Grays, Capt. Brown; the Elk Run Grays, Capt. Covington; the Peaked Mountain Grays, Capt. Yancey; the Letcher Brock's Gap Rifles, Capt. Winfield; Chisman's Infantry, Capt. Chisman." "The Howard Dragoons, Capt. Gaither, from Howard county, reached the city yesterday afternoon, and reported at headquarters." "Among the Virginia forces there, we hear of Captain Ashby's Mounted Rangers, Captain Rogers' Loudoun Artillery, a part of Captain Imboden's command from this post, Captain Carter's Company of Cavalry, and Captain Winfield's company of Rifles." "This morning the bridge connecting Harpers Ferry and Maryland, at Point of Rocks, was burned, by order from this place." The memoirs of General Turner Ashby and his compeers, by Rev. James Battle Avirett, Chaplin Ashby Cavalry and other officers of the Army of Northern Virginia, C.S.A. The 7th Virginia Cavalry was organised at Winchester, Frederick County, Virginia, on 17 June, 1861. Mustered for one year 7 the war, Harpers Ferry, Jefferson County, Virginia, Company A & B (2nd), 3 & 5 May, 1861: The 7th Virginia Cavalry, Company A, was mustered in state service for one year as the 1st Virginia Cavalry, Company G (1st), at Harpers Ferry, Jefferson County, Virginia, by Colonel T J Jackson, Provisional Army of Virginia, on 3 May, 1861, and Company B (2nd) for the war, as the 10th Virginia Infantry, Company B, at Harpers Ferry, Jefferson County, Virginia, on 5 May, 1861. Mustered for the war, Fairfax Courthouse, Fairfax County, Virginia, Company B (1st), 5 May, 1861: The 7th Virginia Cavalry, Company B (1st), was mustered in state or Confederate service for the war at Fairfax Courthouse, Fairfax County, Virginia, on 28 July, 1861. Mustered for one year & war, Harpers Ferry, Jefferson County, & Fairfax Courthouse, Fairfax County, Virginia, 3 & 5 May & 28 July, 1861: The 7th Virginia Cavalry, Company A, was mustered in state service for one year as the 1st Virginia Cavalry, Company G (1st), at Harpers Ferry, Jefferson County, Virginia, by Colonel T J Jackson, Provisional Army of Virginia, on 3 May, 1861; Company B (1st) in Confederate service for the war at Fairfax Courthouse, Fairfax County, Virginia, on 28 July, 1861; and Company B (2nd) for the war, as the 10th Virginia Infantry, Company B, at Harpers Ferry, Jefferson County, Virginia, on 5 May, 1861. Note: A W McDonald, Sr., was stationed as a volunteer aide de camp to Colonel T J Jackson, Provisional Army of Virginia, at Harpers Ferry, Jefferson County, Virginia, on 24 April, 1861, and was appointed colonel, cavalry, Provisional Army of Virginia, on 5 June, 1861. Colonel A W McDonald, Sr., cavalry, Provisional Army of Virginia, arrived at Winchester, Frederick County, Virginia, on 7 June, 1861 (See the First Brigade, Army of the Shenandoah). The Fauquier Mountain Rangers was ordered to seize Harpers Ferry Arsenal and Armory, on Shenandoah and Potomac Streets, Harpers Ferry, Jefferson County, Virginia, on 17 April, 1861. Markham, Fauquier County, to Harpers Ferry, Jefferson County, Virginia, Company A, 16-19 April, 1861: The Fauquier Mountain Rangers, under the command of First Lieutenant R Ashby, was ordered to Harpers Ferry, Jefferson County, Virginia, in the evening on 16 April, 1861, and was accompanied by the Black Horse Troop, under the command of First Lieutenant B Randolph (See Munford's Squadron Cavalry). The company arrived at Halltown, Jefferson County, Virginia, in the evening on 18 April, 1861, and was ordered to proceed by the Middleway, Charlestown & Harpers Ferry Turnpike to Harpers Ferry, Jefferson County, Virginia, at 9 PM the same day. The Fauquier Mountain Rangers, under the command of Captain T Ashby, arrived at Bolivar Heights, one and a half miles west of Harpers Ferry, Jefferson County, Virginia, in the evening on 18 April, 1861, and at Harpers Ferry, Jefferson County, Virginia, at 12 AM on 19 April, 1861. Note: Captain T Ashby, Fauquier Mountain Rangers, was stationed at Richmond, Henrico County, Virginia, in the evening on 16 April, 1861, and was ordered to proceed by the Virginia Central Railroad to Harpers Ferry, Jefferson County, Virginia, in the morning on 17 April, 1861. He was accompanied by J A Selden and was stationed at Harpers Ferry, Jefferson County, Virginia, in the morning on 18 April, 1861. Captain T Ashby, Fauquier Mountain Rangers, arrived by the Winchster & Potomac Railroad at Charlestown, Jefferson County, Virginia, the same day and was ordered to proceed by the Middleway, Charlestown & Harpers Ferry Turnpike to Halltown, Jefferson County, Virginia, at 9 PM on 18 April, 1861. The Fauquier Mountain Rangers was stationed at Harpers Ferry, Jefferson County, Virginia, on 19 April, 1861. Harpers Ferry, Jefferson County, Virginia, to Point of Rocks, Frederick County, Maryland, Company A, 19 April, 1861: The Fauquier Mountain Rangers was ordered to Point of Rocks, Frederick County, Maryland, on 19 April, 1861, and was assigned to picket and guard duty on the Ptomac River, between Harpers Ferry, Jefferson County, Virginia, and Point of Rocks, Frederick County, Maryland, between 19 April and 9 June, 1861. Note: The Letcher Brock's Gap Rifles was ordered to Point of Rocks, Frederick County, Maryland, on 6 May, 1861, and was accompanied by a section of the Staunton Artillery, under the command of Captain J D Imboden (See the Staunton Artillery). The Frederick Volunteers, under the command of Captain B T Johnson, arrived at Point of Rocks, Frederick County, Maryland, on 8 May, 1861, and the Baltimore Rifles, under the command of Captain C C Edelin, on 9 May, 1861. The Fauquier Mountain Rangers was mustered in state service as the 1st Virginia Cavalry, Company G, on 3 May, 1861. Note: The Loudoun Cavalry arrived at Point of Rocks, Frederick County, Maryland, on 23 May, 1861, and the Wise Artillery on 27 May, 1861. Lieutenant Colonel & Assistant Adjutant General G Deas, Confederate States Army, was stationed at Point of Rocks, Frederick County, Maryland, in the evening on 20 May, 1861 (See the Wise Artillery). General Orders No.25, Headquarters, Virginia Forces, Richmond, Henrico County, Virginia, 8 June, 1861: The 7th Virginia Cavalry was assigned to the Confederate States by General Orders No.25, Headquarters, Virginia Forces, Richmond, Henrico County, Virginia, on 8 June, 1861, and was accepted in Confederate service on 1 July, 1861. Point of Rocks, Frederick County, Maryland, to Harpers Ferry, Jefferson County, Virginia, Companies A & B (2nd), 9-10 June, 1861: The Fauquier Mountain Rangers and the Letcher Brock's Gap Rifles were ordered to Harpers Ferry, Jefferson County, Virginia, on 9 June, 1861, and arrived via Waterford, Loudoun County, Virginia, at 9 AM on 10 June, 1861. Note: The Letcher Brock's Gap Rifles destroyed the Covered or Leesburg Bridge, on the Potomac River, Point of Rocks, Frederick County, Maryland, and Lovettsville, Loudoun County, Virginia, in the morning on 9 June, 1861, and was assigned to the 10th Virginia Infantry between 11 and 21 June, 1861 (See the 10th Virginia Infantry). Skirmish at Romney, Hampshire County, Virginia, Company F, 12 June, 1861: The Hampshire Riflemen was engaged in a skirmish at Cemetery Hill, one mile southwest of Romney, Hampshire County, Virginia, under the command of Colonel A C Cummings, Provisional Army of Virginia, in the morning on 12 June, 1861 (See the 33rd Virginia Infantry). Note: The Hampshire Riflemen was ordered to withdraw to Winchester, Frederick County, Virginia, under the command of Colonel A C Cummings, Provisional Army of Virginia, in the morning on 12 June, 1861, and was accompanied by the Potomac Guards and the Independent Greys. The company arrived at Parks' Valley, on the Northwestern Turnpike, two and a half miles west of Capon Bridge, on Cacapon River, via Hanging Rock, Hampshire County, Virginia, on 13 June, 1861. Harpers, Jefferson County, to Romney, Hampshire County, Virginia, Company B (2nd), 13-19 June, 1861: The Letcher Brock's Gap Rifles, as part of the 10th Virginia Infantry, was ordered to proceed by the Winchester & Potomac Railroad to Winchester, Frederick County, Virginia, under the command of Colonel A P Hill, 13th Virginia Infantry, in the morning on 13 June, 1861, and arrived at the Shenandoah Valley Agricultural Society Fairgrounds, one mile northwest of Winchester, Frederick County, Virginia, at 6 PM the same day (See the 13th Virginia Infantry). The company was ordered to proceed by the Northwestern Turnpike to Romney, Hampshire County, Virginia, at 4 AM on 17 June, 1861, and arrived at 11 AM on 18 June, 1861. Note: The Letcher Brock's Gap Rifles was assigned to the 10th Virginia Infantry at Harpers Ferry, Jefferson County, Virginia, on 11 June, 1861 (See the 10th Virginia Infantry). Harpers Ferry, Jefferson County, to Winchester, Frederick County, Virginia, Company A, 14 & 15 June, 1861: The Fauquier Mountain Rangers was assigned to the 7th Virginia Cavalry, Company A, under the command of Colonel A W McDonald, Sr., on 14 June, 1861, and arrived at Hawthorn, half a mile west of Winchester, Frederick County, Virginia, on 15 June, 1861. Loudoun County & Winchester, Frederick County, Virginia, Company B (1st), 14 May-17 June, 1861: The Howard Dragoons was accepted in state of Virginia service at Leesburg, Loudoun County, Virginia, on 14 May, 1861, and stationed at Loudoun County, Virginia, under the command of Colonel E Hunton, 8th Virginia Infantry, between 14 May and 14 June, 1861. The company was ordered to Winchester, Frederick County, Virginia, on 15 June, 1861, and arrived at Winchester, Frederick County, Virginia, in the morning on 17 June, 1861 (See the 1st Virginia Cavalry). Winchester, Frederick County, to Romney, Hampshire County, Virginia, Companies A & B (1st), 18-19 June, 1861: The 7th Virginia Cavalry, Companies A and B (1st), were ordered proceed by the Northwestern Turnpike to Romney, Hampshire County, Virginia, under the command of Colonel A W McDonald, Sr., Provisional Army of Virginia, in the morning on 18 June, 1861, and arrived via Hanging Rock, Hampshire County, Virginia, on 19 June, 1861. Note: The Fauquier Mounted Rangers and the Howard Dragoons were assigned to the 7th Virginia Cavalry, Companies A and B (1st), at Winchester, Frederick County, Virginia, on 17 June, 1861, and Company A, under the command of Captain T Ashby, was stationed at Camp Washington, Washington Bottom Farm or Ridgedale, on South Branch Potomac River, six miles north of Romney, Hampshire County, Virginia, and Company B at Romney, Hampshire County, Virginia, under the command of Colonel A W McDonald, Sr., on 19 June, 1861. Park's Valley, on the Northwestern Turnpike, two & a half miles west of Capon Bridge, to Romney, Hampshire County, Virginia, Company F, 19 June, 1861: The Hampshire Riflemen were ordered to proceed by the Northwestern Turnpike to Romney, Hampshire County, Virginia, in the morning on 19 June, 1861, and was accompanied by the Potomac Guards and the Independent Greys. The company arrived at Romney, Hampshire County, Virginia, at 3 PM the same day and was assigned to Lee's Battalion Infantry, under the command of Acting Major & Captain W F Lee, Provisional Army of Virginia, between 19 and 21 June, 1861 (See the 33rd Virginia Infantry). Note: The Hampshire Riflemen was stationed at Parks' Valley, on the Northwestern Turnpike, two and a half miles west of Capon Bridge, on Cacapon River, Hampshire County, Virginia, between 13 and 19 June, 1861. Hanging Rock & Romney, Hampshire County, Virginia, Company B (2nd), 19-22 June, 1861: The Letcher Brock's Gap Rifles was ordered to Hanging Rock, Hampshire County, Virginia, in the morning on 19 June, 1861, and Captain J Q Winfield, Letcher Brock's Gap Rifles, was assigned to command the Letcher Brock's Gap Rifles and another company at Hanging Rock, Hampshire County, Virginia, between 19 and 22 June, 1861. The Letcher Brock's Gap Rifles was assigned to the 7th Virginia Cavalry, company, B (2nd), at Hanging Rock, Hampshire County, Virginia, on 21 June, 1861, and was ordered to Romney, Hampshire County, Virginia, in the afternoon on 22 June, 1861. Romney, Hampshire County, to J M Mason's House or Selma, half a mile west of Winchester, Frederick County, Virginia, Company F, 21-24 June, 1861: The Hampshire Riflemen, as part of Lee's Battalion Infantry, was ordered to proceed by the Northwestern Turnpike to Winchester, Frederick County, Virginia, on 21 June, 1861, and arrived at Hanging Rock, Hampshire County, Virginia, in the evening the same day. The company was ordered to Capon Bridge, Hampshire County, Virginia, at 3 PM on 22 June, 1861, and to Hog(ue) Creek, west of Lockhart's Gap, Frederick County, Virginia, at 2 AM on 23 June, 1861. The Hampshire Riflemen arrived at Hog(ue) Creek, west of Lockhart's Gap, Frederick County, Virginia, at 7 PM the same day. The company was ordered to J M Mason's House or Selma, half a mile west of Winchester, Frederick County, Virginia, at 7 AM on 24 June, 1861. Note: The Hampshire Riflemen was assigned to the 7th Virginia Cavalry, Company F, at Camp Johnston, vicinity of J M Mason's House or Selma, half a mile west of Winchester, Frederick County, Virginia, on 25 June 1861, and was ordered to Romney, Hampshire County, Virginia, on 27 June, 1861. Romney, Hampshire County, Virginia, 19-27 June, Companies, C, D, E, & I, 1861: The 7th Virginia Cavalry, Companies C and D, arrived at Romney, Hampshire County, Virginia, between 19 and 23 June, 1861; Company I on 24 June, 1861; and Company E between 26 and 27 June, 1861. Skirmish at Kell(e)y's Island, at the junction of Patterson's Creek & the Potomac River, six miles south of Cumberland, Allegany County, Virginia, detachment of Company A, 26 June, 1861: A detachment of the 7th Virginia Cavalry (19), Company A, under the command of Captain R Ashby, was ordered to Patterson's Creek Station, on the Baltimore & Ohio Railroad, Hampshire County, Virginia, in the morning on 26 June, 1861, and a detachment of seven men, under the command of Captain R Ashby, were engaged in a skirmish with a detachment of the 11th Indiana Infantry (13), acting as cavalry, under the command of Corporal D B Hay, 11th Indiana Infantry, Company A, at Kell(e)y's Island, on the Baltimore & Ohio Railroad, at the junction of Patterson's Creek and the Potomac River, six miles south of Cumberland, Allegany County, Virginia, the same day (See the 11th Indiana Infantry). Captain R Ashby, 7th Virginia Cavalry (19), Company A, was mortally wounded during the skirmish at Kell(e)y's Island, on the Baltimore & Ohio Railroad, at the junction of Patterson's Creek and the Potomac River, six miles south of Cumberland, Allegany County, Virginia, on 26 June, 1861, and died at Washington Bottom Farm or Ridgedale, on South Branch Potomac River, six miles north of Romney, Hampshire County, Virginia, at 12 PM on 7 July, 1861. Note: A detachment of the 7th Virginia Cavalry (11), Company A, under the command of Lieutenant Colonel T Ashby, was ordered on a scouting expedition to Patterson's Creek Station, on the Baltimore & Ohio Railroad, Hampshire County, Virginia, in the morning on 26 June, 1861, and arrived at Kell(e)y's Island, on the Baltimore & Ohio Railroad, at the junction of Patterson's Creek and the Potomac River, six miles south of Cumberland, Allegany County, Virginia, at 1 PM the same day. The detachment of Company A was engaged in a skirmish at Kell(e)y's Island, on the Baltimore & Ohio Railroad, at the junction of Patterson's Creek and the Potomac River, six miles south of Cumberland, Allegany County, Virginia, in the afternoon on 26 June, 1861. Skirmish at New Creek Station, on the Baltimore & Ohio Railroad, Hampshire County, Virginia, Company D & detachments, 14 July, 1861: The 7th Virginia Cavalry, Company D, and other detachments of the 7th Virginia Cavalry were engaged in a skirmish with the 13th Pennsylvania Reserve Infantry or 42nd Pennsylania Infantry at New Creek Station, on the Baltimore & Ohio Railroad, Hampshire County, Virginia, on 14 July, 1861 (See the 11th Indiana Infantry). The Army of the Shenandoah, under the command of General J E Johnston, Confederate States Army, was ordered to Manassas Junction, Prince William County, Virginia, by Special Orders No.1, Headquarters, Army of the Shenandoah, Winchester, Frederick County, Virginia, at 1 AM on 18 July, 1861, dated 17 July, 1861. Romney, Hampshire County, to Winchester, Frederick County, Virginia, 19 & 20 July, 1861: The 7th Virginia Cavalry arrived at Winchester, Frederick County, Virginia, in the evening on 19 July, 1861, and was assigned to scouting and picket duty on 20 July, 1861. Winchester, Frederick County, to Bristoe Station, on the Orange & Alexandria Railroad, Prince William County, Virginia, 21-23 July, 1861: The 7th Virginia Cavalry was ordered to Manassas Junction, Prince William County, Virginia, in the morning on 21 July, 1861, and arrived at Upperville via Millwood, Clarke County, and Ashby's Gap, one mile northwest of Paris, Fauquier County, Virginia, in the evening the same day. The regiment was ordered to Haymarket, Prince William County, Virginia, in the morning on 22 July, 1861, and to Bristoe Station, on the Orange & Alexandria Railroad, Prince William County, Virginia, in the evening on 23 July, 1861. Note: The 7th Virginia Cavalry was ordered to Staunton, Augusta County, Virginia, in the morning on 24 July, 1861, and the 7th Virginia Cavalry, Companies C, D, and H (1st), were stationed at Ca(ca)pon Bridge, Hampshire County, Virginia, and E, F, and I, at Hanging Rock, Hampshire County, Virginia, under the command of Colonel A W McDonald, and Companies A, B (2nd), G, and K were assigned to Lieutenant Colonel T Ashby, on 21 October, 1861. Reorganised at Conrad's Store, on Elk Run Creek, Rockingham County, Virginia, 16, 21, 25 June, 5 September, and 13 November, 1862: Twenty-three companies of the 7th Virginia Cavalry were mustered in Confederate service at Conrad's Store, on Elk Run Creek, Rockingham County, Virginia, on 25 April, 1862, and seven companies were assigned to the 17th Virginia Battalion Cavalry on 16 June, 1862; ten companies to the 12th Virginia Cavalry on 21 June, 1862; one company to the 14th Virginia Cavalry on 5 September, 1862; and one company to Ashby's Artillery or Chew's Horse Artillery on 13 November, 1862. Disbanded at Lynchburg, Campbell County, Virginia, 11 April, 1865: The 7th Virginia Cavalry was disbanded at Lynchburg, Campbell County, Virginia, on 11 April, 1865, and thirty-four men surrendered at Appomattox Courthouse, Appotomax County, on 9 April, 1865.